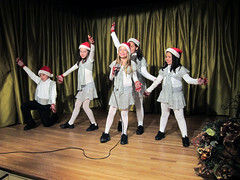 December 11, 2010 – Hollywood: Artists For A Better World’s (AFABW) Holiday Event and Networking Party featured music, singing and dancing at Celebrity Centre International (CCI). The event celebrated the group’s accomplishments over the past year. Additionally, volunteers who helped create the AFABW 10th annual AFABW Arts Festival in October of this year received award commendations. Additionally, associated groups who contributed to their communities also received AFABW award commendations. The party, replete with decorations, holiday music and a buffet, was an opportunity for guests and AFABW members to enjoy the entertainment, appreciate the fine art on display, network and relax. Jo Lauricella, professional speaker and MC for the evening, kicked the show off by introducing singer/songwriter, Johnny Ferro. AFABW Founder, Barbara Cordova Oliver, gave a talk about AFABW achievements and the purpose of the evening’s event. She then performed Bright Lights, an original holiday song. 13-year-old World Champion Youth Tap Dancer, Robert Terry, known as Dr. Tapper, uplifted the audience with his spectacular dancing. Celebrity Centre Kids On Stage for a Better World received a commendation award for their work in the community and performed several holiday tunes. The noted Toastmaster group, The Renaissance Speakers, which has been based out of Celebrity Centre International since 1989, received a commendation for their effectiveness at training public speakers. AFABW member and top internet marketing specialist, Tracy Repchuk, presented the award. Toastmaster, Glenn Broadus, talked about how taking part of Renaissance Speakers, and doing courses at CCI have greatly helped him in life. AFABW President, George Alger, gave a talk on the International activities of AFABW and presented an award to Marcia Powell and the Church of Scientology Choir for their good work. The Choir, adorned in traditional caroling outfits, engaged the audience to sing Christmas carols. Gary Allegretto, who received the AFABW 2010 Spirit of Youth Award, and who is a professional harmonica player and founder of Harmnoikids, performed with musician and professional illustrator, Ian Espinoza, to dazzle the audience with an uplifting performance. Fine art was on display by Shamala Auset, and by Patrick Whelan – who is the recipient of the 2010 AFABW Lifetime Achievement Award. © CSCCI. All Rights Reserved. CELEBRITY CENTRE and Scientology are trademarks and service marks owned by Religious Technology Center and are used with its permission.